How do I get touch tracks working in Logic Pro X? 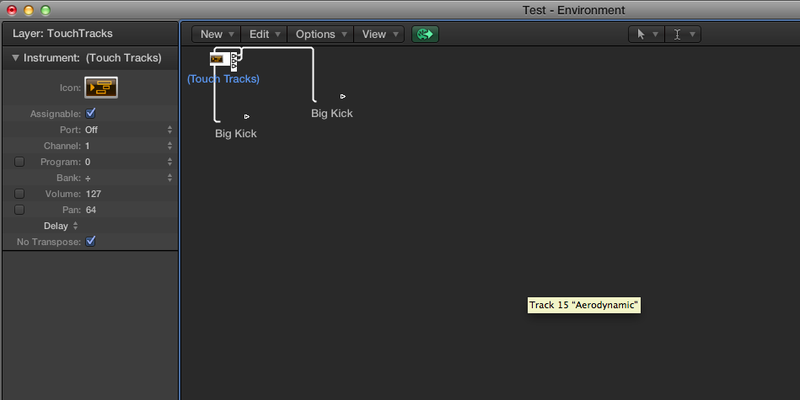 In my Logic Pro X file, I have created a Touch Tracks layer in the environment. I have also assigned a track in the arrange window for Touch Tracks. Also, I assigned midi loops to the touch track keyboard. However, when I try to play the touch tracks through a midi keyboard, no sounds are generated. Can someone explain why this is happening? This question came from our site for sound engineers, producers, editors, and enthusiasts. While Logic is in play mode, are you able to mouse click B2, C3, or D3 on the TT keyboard to generate sound? Note that having Toggle/Gate set means that MIDI region will only trigger one time per playback. Also, your Musical Typing keyboard is grayed out, which means your TT track is not selected and/or armed (R). Also be sure you're MT keyboard is set to the correct octave in order to play B2, C3 or D3. Use the MIDI status to see what note is being triggered at top of Logic Window. And, I can't find any reason why you would have cables going from the TT object to MIDI object. 2. From this environment window: New->Touch Tracks. The TT Environment Window will open. Move it aside for now. Only folders and MIDI regions! No audio regions. is where the content will play from, so it can be tweaked normally. when it's able to accept your drag. 4. Repeat until you've loaded up all your content. 6. Play corresponding MIDI note to trigger the MIDI region.